Chimney Rock Outfitters provides exclusive hunting of elk, mule deer, whitetail deer, moose and black bear on 35,000 acres of private land with a fair chase opportunity. The first priority for Chimney Rock Outfitters is locating a 5X5 or larger bull elk for you. We have a 90% success rate on 5X5 bull elk. Compare our rate with other elk hunting operations, and you'll see why you should choose us for your next Montana elk hunt. Experience a week of Montana hunting and hospitality with experienced, veteran guides in southwestern Montana. Guides are Jim, Mike, Levi and Charlie who have over 50 years combined experience guiding for Chimney Rock Outfitters. They know all the territory we hunt - every draw, gulch, hilltop, ridge, and section - and they'll help you find the animal you've wanted for years. Over 80 sections of private land, quality guides, comfortable hunt camp, simple, wholesome meals, and friendly hosts: You won't find a better hunting situation in Montana. Contact us and we'll provide you with a fantastic opportunity to fullfill your hunting dreams. We offer 7-day hunts and take a maximum of 4 hunters during our archery season and 8 hunters during our rifle season. We provide a guide for every two hunters. Your arrival is on a Saturday afternoon at 1:00, and your departure is on the following Saturday by noon. Your guides will meet you on your arrival day and we begin with checking of equipment and sighting in of rifles, then move on to camp to get settled in. Our hunts are typically a spot-and-stalk-type hunt, and your transportation is by four wheel drive and Polaris 6 wheelers. 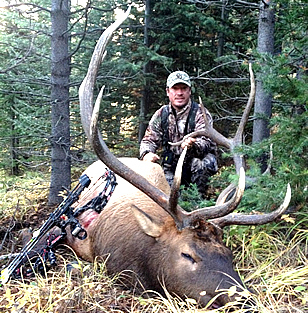 Chimney Rock Outfitters carefully manages the elk and deer for maximum potential trophies. Our Montana guides are skilled, knowledgeable, professional private land outfitters with 50 years collective guiding experience. They will work to ensure your hunt will be a uniquely memorable and rewarding experience. Your acquired bull will be field-dressed and extracted with a minimal disturbance to the herd, helping to ensure elk presence for the entire season. Our success rate on 5x5 bulls or better is over 90%. Our experienced guides work very hard at properly managing our elk and deer herds and animals will be harvested under your guides discretion. We do have a policy on wounded animals: If a wounded animal cannot be retrieved, your hunt for that species will end in order to protect and maintain the quality of our big game animals. Your hosts are Justin and Judy O'Hair, the fifth generation operating the O'Hair Ranch Company. As a Montana working rancher, Justin O'Hair is intimately familiar with this land, the habitat and wildlife patterns. More than 55 sections of land are reserved for your full week's hunt. The original 350-acre Armstrong/O'Hair ranch was settled in 1876 by Missourian O.T. Armstrong with a small herd of cattle. Today, under O'Hair family management, the property operates as a working cattle ranch counting over 1,000 head grazing on about 30,000 acres, split equally between deeded and leased ground. For best viewing, make sure the HD option is on, then open the video to full screen. The Last Best Place - Trailer from Broken Bow Video Productions on Vimeo. The Reserve, a high mountain plateau at approximatedly 7800 feet, offers a view of Livingston, the Bridger Mountains, Crazy Mountains, Absarokee/Beartooth Mountains, and the Paradise Valley. "I have seen over 500 head of elk in one herd on the Reserve during hunting season." Each of the terrain drainages we hunt presents a matchless and varied experience for every hunter in the party. The range terrain consists of numerous rolling to steep drainages: Strickland Creek, West Pine Creek, Trail Creek and Bullis Creek all migrate to the Paradise Valley floor. 2,000 acres of irrigated alfalfa and grass hay meadows lure elk, mule deer and whitetail deer to feed at night. By daybreak, guided clients will often witness 200 head of elk still feeding in these meadows. Wildlife abundance is well known in this area: large resident herds of elk, mule and whitetail deer, moose and black bear. The yearly USFWP elk count in the drainages each spring number more than 1000 head ranging in the area. The elk numbers are increasing by 15-20% yearly. Read some comments our clients have made over the years. Check back for feedback from clients who have enjoyed our hunts, services, and hospitality. If you enjoy our hunting services, why not tell others about your experience? Send any correspondence to Judy O'Hair, and we'll add you to our testimonials.